Homemade granola is one of the easiest breakfasts or snacks and this recipe for quinoa granola is no different, except it has the benefit of an extra protein boost! Dark chocolate pomegranates and banana chips add a little sweetness and fun. In a medium bowl, mix together the oats, quinoa, flaxseed, coconut, cinnamon, and salt. Stir in maple syrup. On a foil-covered baking sheet, spread the granola mixture in an even layer. Bake for about 30-40 minutes, stirring occasionally with a spatula to prevent browning. Remove granola from oven, let it cool, and mix in dark chocolate-covered pomegranates and banana chips. Store granola in airtight container. 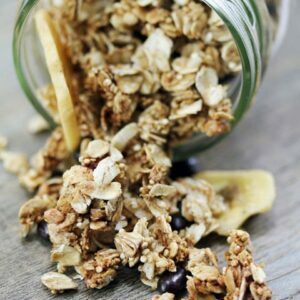 Granola should keep for about 4 weeks in an airtight container.